David Mamet’s best film, this is a mystery-noir that keeps things eerie and suspenseful as both the clues and twists pile up. A perfect mystery, this one is remeniscent of some of the greats, like the usual suspects and north by northwest. it takes its time to build relationships and situations, letting us know that there are clues to be paying attention to, without knowing exactly why. the movie does fine work with details and music and setting the mood of a creepy film noir atmosphere where you can’t trust anyone. all of the acting is great, but steve martin is the standout, being dark and serious in ways that we’ve never seen of him beofre. for writer / director david mamet, this movie is a crowning achievment, really thrilling us and keeping us on our toes, excited to figure out what the clues mean. The Spanish Prisoner is a fantastic mystery. it moves in such a way where you can tell that every detail is important and big things are coming, but you can never be sure of from where and by whom. the mystery involves strangers and ancient wisdom about how to protect an interest that you have, which others want. the movie is about stolen property and the idea that you never really know who someone is when you meet him. at the start of the movie we meet joe ross (campbell scott), who is on a business trip in the bahammas. he’s there with his lawyer, george (ricky jay), his boss, mr. klein, (ben gazarra) and the companies new secretary, susan (rebecca pidgeon). the reason for the meeting is because joe has a process which is going to be revolutionary and will make the company a lot of money. we never get firm details about what exactly the process is, or even how much money it will resonate, but those things are mcguffins and not very important. we get the idea. joe has something big and valuable, and everyone is interested. it’s while on this trip that joe notices a sea plane fly by and land off in the distance. then a boat sails over to them from the area of the plane, and a man and woman get out. joe and the secretary are taking pictures when the man, jimmy dell (steve martin, like you’ve never seen him before), approaches him. he offers joe a thousand dollars for the camera, and as a gesture of good faith, joe just gives it over. jimmy and joe go to have a drink later on that night, and jimmy explains everything. he is vacationing with his best friend’s wife, with who he is having an affair. aside from that, the wife is a princess, and well known to people of her country. there can be no photographs that catch her in the background to show that she was there, or which catch both of them in the background together. the funny thing about this elaborate story of the secret affair and not getting caught, is that it’s a tiny sideplot, and in no way related to the main storyline of the movie. that’s how great this movie is, like tarantino’s films, it can invent whole other storylines, mention them in the dialogue (the story of the guy in pulp fiction who gave mia wallace a foot massage and got thrown through a window), and actually have nothing to do with them as part of the films real story. joe and jimmy plan to meet up in new york in about a week. jimmy also has a favor to ask of joe. he wants joe to drop a book off for his sister in new york, since joe will be getting there a week before him. jimmy does this when he arrives in new york, but the circumstances surrounding it are strange. so are those surrounding the idea of this man, jimmy, giving joe a package to bring on the plane. there is a lot of suspicion here, with susan pointing things out to joe such as the possibility that jimmy did not come from the plane, or that maybe the package has drugs in it. none of these suspicions turns out to be relevant, kind of like that affair story from earlier, and it’s just writer / director david mamet, getting our attention, putting us on high alert, and telling us to focus on every detail. you never know what’s coming. i love the way the movie doesn’t take any of the obvious routes. the package could have easily had something illegal in it, but this movie is too smart for that and wants to work the audience and shape them before unloading any real plot points. the first hour of this movie is all setup and clues. the actual crime or mystery doesn’t unfold until after that, and the amazing accomplishment is that even without a mystery, mamet’s screenplay and vision are able to hold our attention and keep us glued to the screen for the entire time. chalk that up to his fascinating dialogue, characters, and feel that something creepy is happening behind the scenes, even if we don’t know what it is yet. once the mystery does get underway, this film suddenly becomes like north by northwest or any other movie where a regular guy is caught in a game that he never saw coming. despite having similarities to other movies in the film noir genre, this film still manages to be it’s own thing, complete with fantastic direction and music. it’s also nice that there are so many characters and situations to be suspicious of that the net of who we can’t trust or be certain about gets very large. 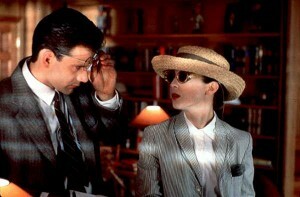 the spanish prisoner is by far and away mamet’s best film. it’s red belt after that, which has a lot of similarities to this movie with a similar crime and mystery. only the spanish prisoner really gets that guy on the street, running around, trying to avoid the cops and also solve the mystery at the same time, kind of feel. the sound of the movie is perfect, combining spooky jazz music with many moments of silence. 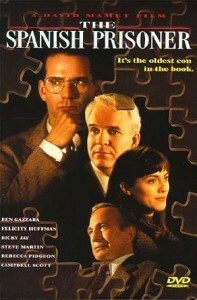 all of the actors are great here, and steve martin in particular is serious and darker than ever. what a cool movie.